Miltenyi Biotec developed the MACSQuant® Tyto® with four benefits in mind: sterility, safety, gentle sorting, and ease of use. The MACSQuant Tyto performs sorting based on a mechanical valve within a closed cartridge system without the use of sheath fluidics. This chapter explains the sorting principle and the related sort valve timing in detail. A comparison between conventional droplet sorters and the MACSQuant Tyto in terms of workflow and technology is shown. Key features of cartridge safety and robustness and the option of consecutive sorting steps are highlighted. Sorting on the MACSQuant Tyto takes place within the completely closed MACSQuant Tyto Cartridge. The cartridge consists of three chambers, input chamber, positive collection chamber, and negative collection chamber. Prior to sorting, fluorescently labeled cells are loaded into the input chamber which contains an adjustable propeller that keeps cells in suspension during the sort. Driven by low air pressure (<3 psi, i.e., <20.7 kPa) applied to the input chamber through a pressure inlet, cells flow from the input chamber, via a microchannel, into the microchip containing the sorting valve. Within the microchip, just before the valve, cells are interrogated by three lasers. Fluorescence and scatter light signatures caused by the laser interrogation are used to distinguish negative cells from target cells. Negative cells are, by default, directed towards the negative collection chamber. To redirect a target cell into the positive collection chamber, a magnetic field is applied to the microchip, which triggers the sorting valve to open and change the flow from the microchip towards the positive collection chamber. Cell sorting within the MACSQuant Tyto Cartridge. When the MACSQuant Tyto Cartridge is placed in the MACSQuant Tyto Instrument, a solenoid is located adjacent to the microchip. When the solenoid is charged, it attracts the microvalve, which contains a nickel/iron core, thereby changing the direction of the flow within the microchip. By default, cells flow towards the negative collection chamber. When the microvalve moves towards the solenoid, cells are directed into the positive collection chamber. When the charge is removed, a silicon spring returns the microvalve into its original position. Accurate valve opening is crucial to achieve an effective separation of positive and negative cells. To this end, the instrument precisely predicts the arrival of a target cell at the valve. To anticipate when a target cell will be arriving at the valve, the time of flight (TOF), and thus the speed, is determined. To define the TOF, the time it takes for a cell to travel between two adjacent lasers is measured on two photomultiplier tube (PMT) channels, the so-called trigger channel and cell speed channel. The trigger channel is used to set the threshold that instructs the instrument as to what should be considered a positive event, i.e., a target cell. Due to differences in the flow speed within the microchannel of the MACSQuant Tyto Cartridge chip, trigger and cell speed channels are preferably selected based on adjacent lasers closest to the sort valve. This setup enables optimal cell speed determination. 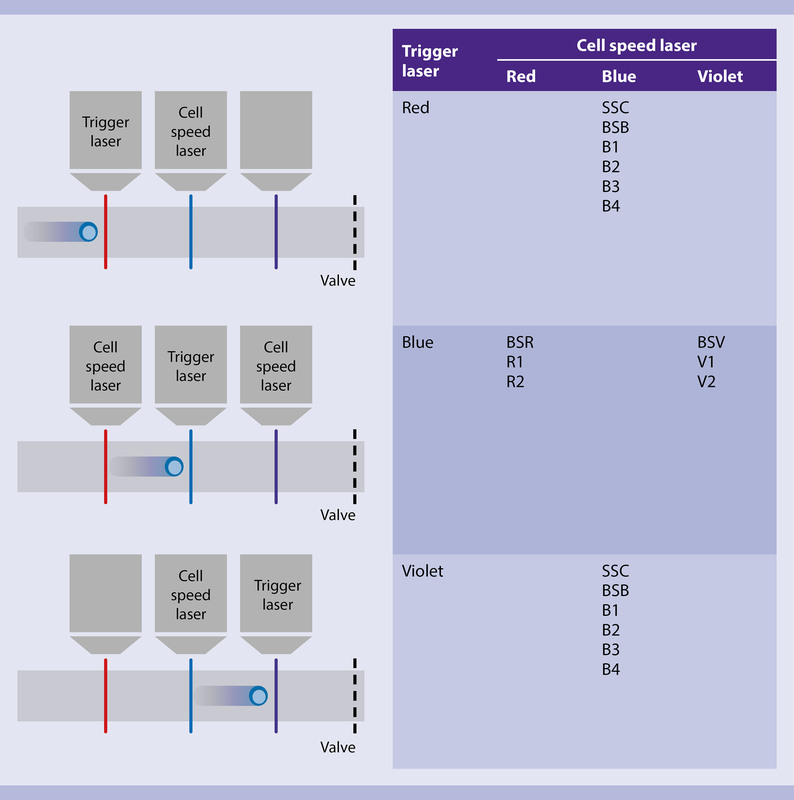 Below figure shows a schematic overview of recommended trigger/cell speed laser combinations. A short instruction with detailed information on valve timing can be downloaded from the related resources panel to the right[MO1]. Overview of recommended trigger/cell speed laser combinations on the MACSQuant Tyto. The average TOF is determined by taking into account all cells that exceed a pre-defined fluorescence intensity level, the so-called cell speed threshold, at the trigger channel. According to the average TOF the sorting pressure on the input chamber is automatically adjusted. Why is this useful? By setting the cell speed threshold just below the population of interest, the flow in the microchannel of the cartridge can be adjusted to obtain optimal conditions for the most accurate sort performance. Additionally, the noise affecting the determination of the average TOF can be minimized. In an ideal world, cells would be sorted at high speed, purity, and yield at the same time (see figure below, A). In reality, however, the sorting performance is always a compromise between the three parameters. Assuming a constant speed, sorting for highest purity is usually at the expense of yield (B), and, vice versa, sorting for high yield results in lower purity (C). Similarly, if choosing a high sorting speed, purity and yield will be compromised (D). This principle applies to all existing sorting instruments available in the market. On the MACSQuant Tyto either yield, purity, or balanced mode can be selected as a sort algorithm. In yield mode, the sorting algorithm specifically selects all events that are determined as positive events. In purity mode, emphasis is on selecting single, isolated positive events to increase the purity of the positive sort population. Balanced mode reaches a balance between purity and yield. Depending on the application and setting (purity, yield, or balanced mode), purities of 99% and yields >70% can be achieved using the MACSQuant Tyto. Final purity and yield always depend on additional factors such as the cell type being sorted, cell density in the input sample, or the concentration of target cells in the input sample. Interrelationship between purity, yield, and sorting speed. Interrelationship between purity, yield and sorting speed. Instrument can be operated easily by lab professionals without intensive training. Cartridge identification is performed by a barcode scanner, which automatically detects cartridge type and lot. Loading of the cartridge into the instruments occurs in an intuitive “plug-and-play” fashion. Flow control, laser alignment, speed detection, and valve timing are fully automated. The automated sort setup function for a variety of applications adds to the ease of use. Actual sorting process is completely hands-off, saving time, resources, and thus money. How do all these features add up in the overall hands-on time? Below table summarizes a side-by-side comparison between the workflows of the MACSQuant Tyto and a conventional droplet sorter. The technology behind the MACSQuant Tyto is unique in its kind. 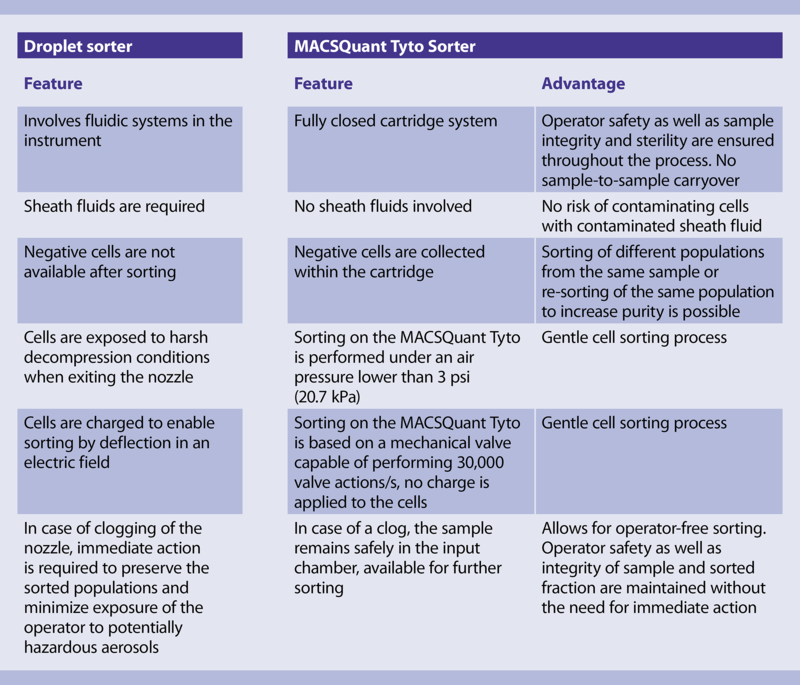 Below table points out the key features and benefits of the MACSQuant Tyto compared to conventional droplet sorters. The MACSQuant Tyto Cartridge ensures a high level of safety during sorting. Air used for pressurizing the input chamber to control the sorting flow is pre-filtered. All MACSQuant Tyto Cartridges undergo a validated and strictly monitored sterilization process using ethylene oxide, ensuring full sterility. The MACSQuant Tyto Cartridge enables a reliable and robust cell sorting process. 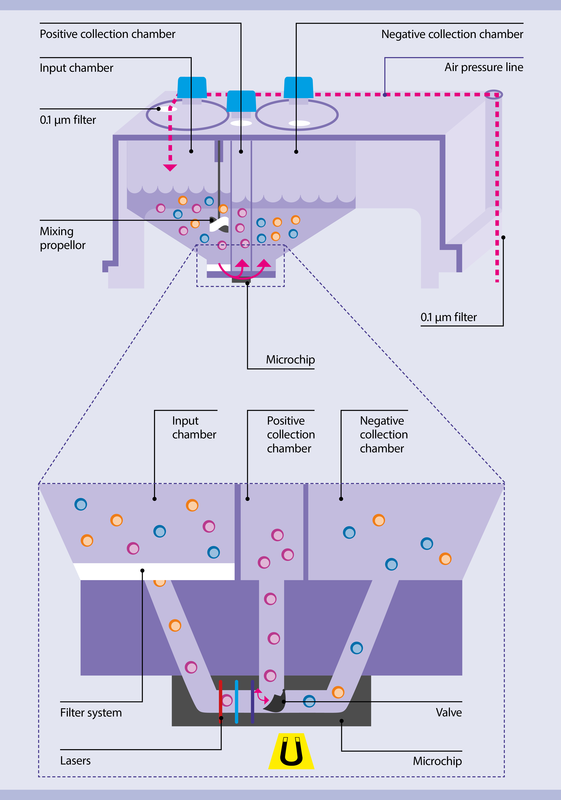 3D filter is located within the input chamber in front of the microchannel to retain larger particles and aggregates and prevent blockage of the sorting valve. In the unlikely event of a clog in the microchannel, an instant, high-vibrating fluid stream helps to dissolve the clog. In case of a persistent clog of the microchannel, the MACSQuant Tyto Cartridge, in contrast to conventional droplet sorters, allows for complete recovery of the sample without risk of cross-contamination of the sorted fraction. The remaining sample simply needs to be removed from the input chamber and loaded into a new cartridge to continue the sort process. During the sort, automated laser re-alignment is executed continuously based on marks on the microchip. This ensures optimal sort conditions during the entire process. Automated flow control, speed detection, and valve timing allow for a completely operator-free sort process. During the sort of a particular target cell population on the MACSQuant Tyto, the unsorted non-target cells are collected in the negative sorting chamber, thus available for further sorting steps. This feature serves three purposes. Rare target cell populations (<0.05% of original sample) can be sorted to high purity by performing a two-step sort: an initial sorting with emphasis on high yield, followed by an additional sorting aiming at high purity. To increase the yield after an initial sorting round aiming at purity, the negative population can be processed in the same way to obtain even more target cells out of this population. This method can be helpful for the isolation of rare cell populations such as tumor-infiltrating lymphocytes (TILs) or when using precious FFPE material. The MACSQuant Tyto allows for sorting of multiple populations out of a single sample. Since the negative fraction is preserved after a sort, this fraction can be subsequently sorted to obtain a functionally different population.